ACEP Neurologic Emergencies CME Collection (ACEP16), provides an overview of the symptoms, clinical presentation, historical factors, disease mechanisms, diagnostic approaches and treatment options of common neurological conditions. This course also includes 3.5 hours of stroke CME. Click anywhere on the image below to launch Dr. Evie Marcoloni's lecture. Advanced Neuroimaging for Acute Ischemic Stroke: What is the Role of CTA, CTP, and MRI? 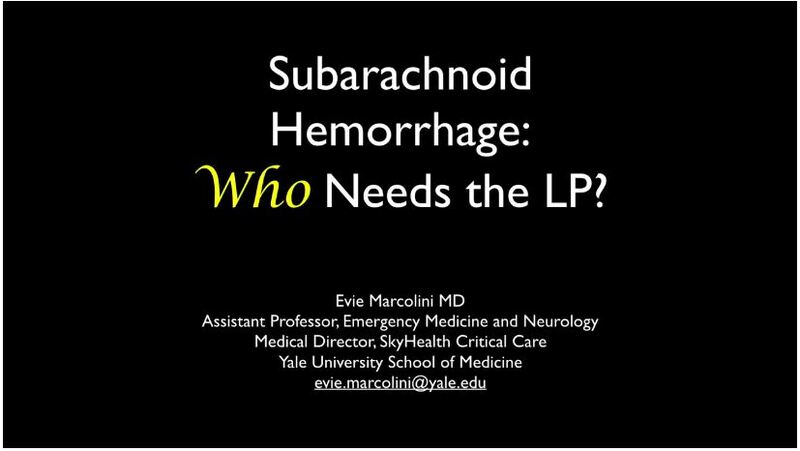 Subarachnoid Hemorrhage: Who Needs the LP? RAPID FIRE: Beyond NEXUS: The latest in C-Spine Clearance! The American College of Emergency Physicians designates this enduring material for a maximum of 16 AMA PRA Category 1 CreditsTM. Physicians should claim only the credit commensurate with the extent of their participation in the activity.